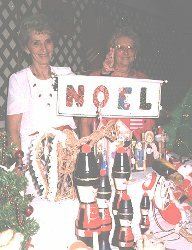 Creative ladies, Ruth Montgomery, Ruth McLaughlin, Doris Dein and Alice Fekete serving the doughnut holes. 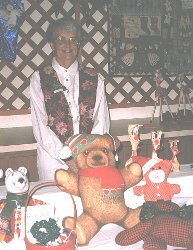 decorations, stuffed toys, ceramic ducks, sweatshirts, T-shirts, aprons, wind chimes, gag gifts, and thousand of other items. Coffee and doughnuts holes were available for the early bird shoppers, as was a great lunch. The proceeds from this sale will be used to fund mission projects and scholarships. 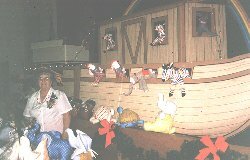 Creative Lady, Alice Buck in front of "Noah's Ark." 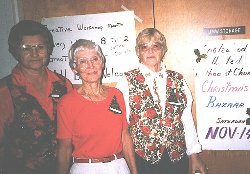 Creative Ladies of the creative Workshop, Charlotte Harris, Bette Valentinsen and Bev Sanderson. June Stephens add Marcie Stephens from North Port. 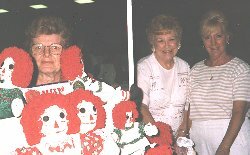 Dorothy Lohman peeks through the Raggedy Ann add Andy dolls, with Mary Martin and Louise McColl. Creative men at the Christmas bazaar, Pete Montgomery, Frank Stollard and George Albrecht. 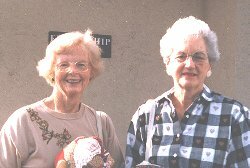 Showing some of their acquired treasures are Martin Kelly and Verna Stevens. 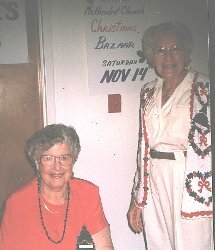 Creative Ladies, Evelyn Brooks and Myra Stilwill. 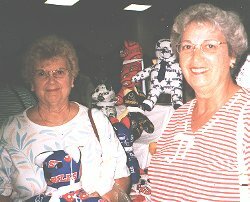 Creative Ladies, Kay Doody and Helen Kubly. Kubly. 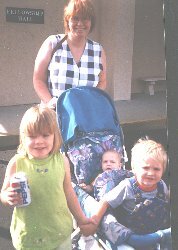 Christmas Bazaar is a Collier family event with Alyssa, Michael Christopher and Mom, Jennifer.